Green Bay Packers quarterback Aaron Rodgers (right) celebrates with wide receiver Randall Cobb after Cobb made the game-winning touchdown reception in the Packers' 33-28 win against the Bears to capture the NFC North title. CHICAGO — A few days before the Green Bay Packers’ regular-season finale, neither quarterback Aaron Rodgers nor wide receiver Randall Cobb were cleared to play. By the end of Week 17, it was a Rodgers-to-Cobb connection that gave the Packers a come-from-behind victory over the Chicago Bears to win the NFC North. With 46 seconds remaining, facing a 4th-and-8 and Green Bay trailing 28-27, Rodgers was chased out of the pocket, rolled left and looked downfield to see Cobb wide open. Eight seconds and 48 yards later, the two returning Packers were celebrating their game-winning score in the end zone. "It was crazy," Rodgers said. "When that ball came down in the end zone, it was just pandemonium." The Bears brought seven-man pressure, but Rodgers under fire is often even better than when he has time in the pocket to throw. Rodgers credited John Kuhn for being "the unsung hero" when the veteran fullback threw a successful cut-block on a blitzing Julius Peppers. That brought Rodgers the extra second that he needed to make one of the biggest throws of his already storied career. With Chicago in man coverage, Cobb’s vertical route simply took him right past the Bears’ secondary. "Aaron and Randall just made a phenomenal play," coach Mike McCarthy said. "It’s two guys making a great, great play that’ll be running on the highlights now for the rest of my time on this Earth. What a great finish." This was Rodgers’ first game in 55 days. 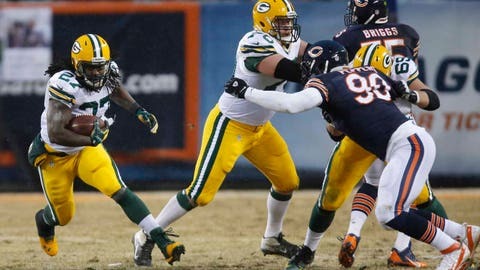 It was on Nov. 4 that Rodgers fractured his left collarbone at the hands of Chicago defensive end Shea McClellin in the first matchup between the two long-time rival teams. Rodgers used the word "redemption" hours after finding out that he’d be back to face the Bears. By helping the Packers claim the division title in Chicago, Rodgers succeeded in doing just that. "Right near the top," Rodgers said when asked where he’d rank the overall moment of the touchdown pass to Cobb in his career. It certainly wasn’t Rodgers’ best game ever. He uncharacteristically threw two interceptions, something he’s only done one other time in the past three seasons. Rodgers’ 85.2 passer rating was well below his season and career averages. But, considering the outcome of his final passing attempt, Rodgers was pleased. "I felt good," Rodgers said. "I was throwing the ball the way I wanted to. I missed some, but I think the weather and the cold and the wind had something to do with that. It’s a tough place to play in December here. I didn’t feel any of the rust. I just missed a couple passes and unfortunately they went for interceptions." Rodgers has only had two recent practices taking the starter’s reps, but with this game and now a full week of upcoming practices, the former NFL Most Valuable Player is confident that his performance in Chicago was just a starting point. "I’m going to get better, I think, as the weeks go on and I continue to get back into the swing of things," Rodgers said. Rodgers benefitted from not taking too many hits near his left collarbone area. The most notable hit was a second-quarter sack by Lance Briggs and a subsequent unnecessary roughness penalty on McClellin — which Rodgers said "wasn’t a dirty play at all." The only other sacks on Rodgers were a strip-fumble and one in which he slid for a 0-yard loss. "I really didn’t take any major shots," Rodgers said. "I slid once, well, slid a couple times, I guess. The guys kept me really clean up front, didn’t really take a lot of shots after I threw it. I think the protection was very good." Rodgers finished the game 25-of-39 passing for 318 yards with two touchdowns and two interceptions. "I thought Aaron played great," McCarthy said. "We can sit here and talk about what he didn’t do, but I think we’ve got to focus on what he did do. He kept us in clean plays. We tried to give him some throws early. The vertical game was there. You hope for people to play like that and ultimately Aaron got it done down the stretch when we scored a bunch of points. I think that clearly reflects how we played offensively and when you’re in the no-huddle, a lot of that is on the quarterback." While Rodgers had known since Thursday that he would play, Cobb found out just 24 hours before the game. Cobb had been on injured reserve with a designation to return since he fractured his tibia on Oct. 13. He was finally activated back to the roster Saturday and was listed as questionable with a knee injury. Cobb knew he’d play, though. "I don’t even think I slept last night, I was just so excited to play again," Cobb said. "Kind of like a little kid, I’m grateful, I’m grateful for the opportunity to put the green and gold back on and be able to play. It was kind of a surreal day for me." Cobb admitted that he was on a "snap count" and that he "expected to play less." However, when he made it through the first 59-plus minutes of the game without getting hit, it kept him available to continue playing. It wasn’t until his final-minute touchdown that Cobb was hit. For a receiver who is reliant on his speed and breakaway ability, Cobb looked comfortable and confident in his routes, especially considering he was first cleared to run 16 days earlier. When Cobb found himself wide open with a chance to win the game, he had a lot running through his mind. "Oh, my gosh, it was in the air for so long," Cobb said. "’You better not drop it. If you drop it, they’re going to kill you, everybody. You better catch it. Just catch the ball. Body-catch it if you have to. Do whatever you have to do,’ and I was able to make the catch." 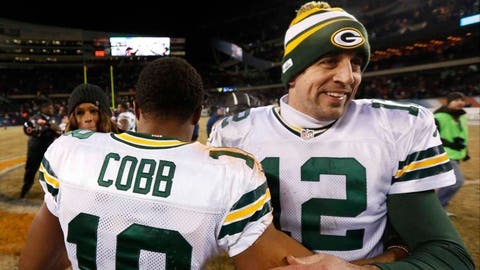 For two players of Rodgers’ and Cobb’s talent, it would normally be expected that they’d perform well in a must-win game. But after such extended absences for both of them, the Packers got two of their biggest playmakers back just in time. "I think Aaron and Randall showed how they can impact a game," McCarthy said. "It was clearly evident today."